Chile Rellenos were one of the first foods my Mexican grandmother, Mita, taught my mami to make when she moved to the United States from Spain. Since most of the ingredients she was used to cooking with were not yet available in the U.S., my mami started learning many new Mexican recipes and chile rellenos was among her favorites. Sure enough, chili rellenos, stuffed peppers, made it into our weekly menu rotation. Since my mami is a Spaniard through and through, she has never quite taken to spicy foods. So instead of using poblano peppers which can be quite spicy, she has always stuffed sweet bell peppers with cheese. Today, I can’t imagine eating a spicy chile relleno any other way. The sweeter version brings me back to my childhood and in turn, it’s what I make for my own children. Since we are in the heat of late summer, peppers can be found in abundance at any farmers market. You can certainly stuff the peppers with any variety of meat but in its tradition, chile relleno were stuffed with cheese and are my favorite way to enjoy them. This makes them quite economical. There served best on a bed of slow fire roasted tomates and with a side of Mexican rice. 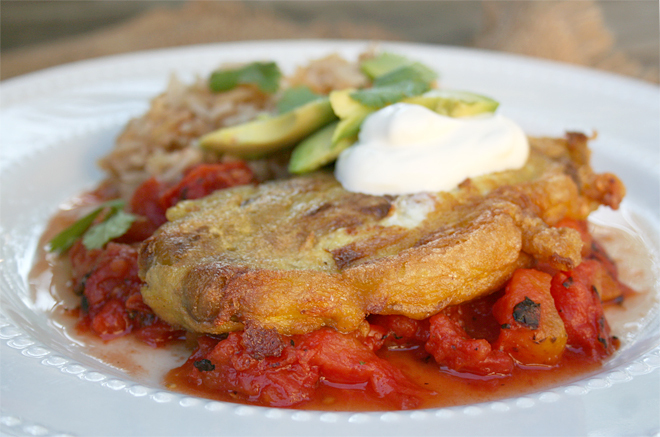 I’ve seen many recipes for chile rellenos which call for using a batter made of flour. These chile rellenos are made with a simple egg batter. The whites of the eggs are first whisked to stiff peaks and the yolks are then whisked together and gently folded into the whites making a fluffy batter. I then dip each roasted and stuffed pepper into the egg batter and make sure to pile on enough onto each chile. Then, I fry it in extra virgin olive oil (cooked the right way). The end result is a chile that is perfectly battered – light and airy that you can gently crunch into. Just like mami used to make. A recipe for traditional Mexican chile rellenos, stuffed peppers with cheese. Broil the bell or poblano peppers on a baking dish for about 5-8 minutes per side or until blackened and charred. Once done, place the peppers in a brown paper bag or covered with a damp cloth in a dish until cooled. Once cooled, cut the tops off and remove the skins and seeds. Separate the egg yolks from the whites. By hand or using an electric mixer, beat the egg whites on high speed until stiff peaks form. In a separate bowl, whisk the egg yolks until light and frothy. Gently, fold in the egg yolks into the egg whites until just incorporated. Do not overmix. Once the peppers have cooled and have had their skins and seeds removed, stuff them with a cheese mixture of both cheddar and mozzarella. Gently, lift them and coat them with the egg mixture giving them a good coating. Gently heat 1/2" of extra virgin olive oil and fry the peppers in a large skillet or cast iron pan until golden brown on both sides. 3-4 minutes per side. Set aside and sprinkle with sea salt. In a separate pan, heat the diced tomatoes. Peppers are in high season. Please share with me your favorite recipes you’ve been eating using peppers in the comments below. You couldn’t have posted this recipe at a more perfect time! I have a bountiful harvest of poblanos from my garden sitting on my kitchen counter begging me to use them for dinner tonight! Your recipe is one of the simplest I’ve seen–I can hardly wait to make it. Thanks. These look awesome! I am so making these! I roasted 2 pounds of jalapeno peppers peeled and seeded them. Then I chopped them finely, mixed them with 8 oz cream cheese added juice from 1/2 lime and added garlic salt to taste! Great on sandwiches or just on a plain tortilla! Diana, primera vez que entro en tu cocina. Se me antojaron de inmediato los chiles rellenos. Los chiles rellenos auténticos mexicanos, los rellenamos de queso fresco (de rancho) o queso asadero como el Oaxaca. Ya que están rellenos se enharinan (se empolvan con harina de trigo) esto es para que el huevo batido se pegue muy bien a los chiles. (nunca en una pasta de harina como dices) solo empolvados y quitando el exceso. Prueba de esta manera. Saludos desde México! Gracias Nora 🙂 Me encanta el queso fresco, pero como es muy difícil de encontrar alimentado con pasto o orgánica, me gusta utilizar el queso cheddar regular, y tambien la forma en que mi mami lo hacia 😉 La receta que utilizo no utiliza ningún tipo de harina, solamente huevo. Gracias por commentar! I’m looking forward to making these! The only way to get good Mexican food in these parts is to make it myself!